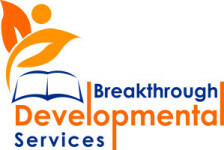 At Breakthrough Developmental Services, LLC (BDS) we believe that everyone can learn, grow, and live a more independent life. We love to help people with development, intellectual, and learning disabilities reach these goal. We do this by teaching academic, daily living, and social skills using applied behavior analysis.